I have a thing about business cards. These little rectangular pieces of stiff paper or card seem to me to have outlived their analogue usefulness in today’s digital world. What are you supposed to do with one when someone gives you theirs? You somehow have to get their contact info from the card and into your contacts list in Outlook or Evernote or whatever tool you use. That usually means typing it in unless you’re an fan of OCR software (and who regularly uses that for something like this? ), or take a photo of it, post it somewhere and hope an app will be able to accurately extract the useful data from your image. There was the fad recently of touching smartphones together so an app like Bump would transfer contact info that way. I don’t know anyone who does that today. 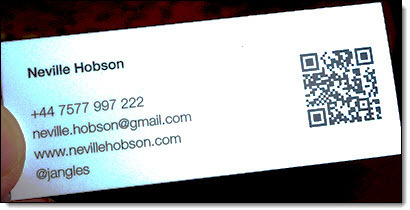 In 2009, I got excited about the potential of QR codes on business cards as one way of making the paper card useful in that it would be easy to get someone’s contact info from the card and into your digital domain relatively easily. And no typing! I still think the QR code is a useful technology for this purpose, and continue to use one on my business cards. Yet they still require you to go through some hurdles just to make the information on that bit of paper come to life digitally. So you have to load up a barcode scanner on your smartphone or other suitable mobile device (you did install one, right?). You have to hold the card in one hand or put it down somewhere, get the barcode app to scan it, open up the result in your browser, and then what? Much depends on what the QR code creator has done with the code. Maybe it gives you something useful, eg, contact info in a format your contact software can directly use. Perhaps a page on a website that has that plus useful links, other content, etc. But here’s something new that could be a better solution (with a huge caveat, though: more on that in a minute) – business cards embedded with an NFC chip where you wave your NFC -enabled card close to a suitable mobile device – you don’t have the touch the device – to transfer information. So a lot of potential to come. When? Well, according to Gartner in their latest hype cycle for emerging technologies, NFC is presently on the downslope from the peak of inflated expectations towards the trough of disillusionment. Gartner thinks it will be 2-5 years before NFC reaches its plateau of productivity. When you say your first hello and present your business card, you’re offering up a little piece of yourself – but with an NFC card it can be a great big piece. Embedded in the card is a tiny microchip. When it’s touched to a smartphone, the chip asks the phone to do something. Something you’ve told it to. Perhaps download your portfolio, play music or video, load web pages, maps or apps, save your contact details – the possibilities are endless. So the technology is present and the ability and intent to use it for a purpose such as a business card is clear. What’s not here yet is device ubiquity, ie, devices that have NFC chips built in. There are not enough devices yet. But that’s the picture today. It will change as newer devices come to market with all the required bells and whistles and more people get such devices, and those devices enable you to do interesting, useful and productive things better, more securely and/or more easily than you can now. I think big drivers behind the introduction of such technologies into the marketplace will be things like contactless payment systems and mobile payment. QR codes face similar hurdles, ie, it needs to be easier and simpler for smartphone users to make use of them (and for code creators to create imaginative experiences when someone scans a code). That could be resolved by having the required barcode scanning software built-in to smartphones, where scanning a QR code means simply pointing your device’s camera at one and hey presto! Lots of innovation coming. In the meantime, think of how to make your analogue business cards deliver more use to those you give them to. I’d argue that the user experience of NFC business card is much better than the one using OCR, QRcode or Vcard (faster, works offline, more content, easy to update, etc.). It is a connected business cards solution that aims to increase your network on the spot, remember not only whom you met, but when and where you met them, and take action! Indeed it is a fun & easy way to connect and stay in touch with people you meet. Thanks for the links, Mr POP, and the disclosure. PopWings looks interesting. But you face a similar situation as MOO does with their NFC card, ie, broad lack of NFC-enabled devices that currently make the tech and the experience still an early-adopter one. – Handset makers are supporting NFC. Obviously the android smartphones stars (such as Samsung galaxy SIII, Note II) and Windows Phone 8 coming with Nokia Lumia . – In the meantime, we are working with early adopters to build this amazing NFC business card experience in specific environment like events for example. – The NFC ecosystem is definitely looking for fun & easy solutions to educate the market to ease the arrival of NFC for payment. i.e Video games will participate to that (WII U). Let’s make the NFC magic come true!